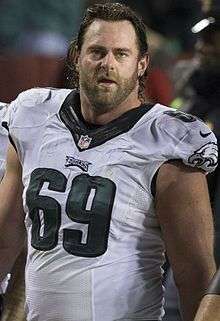 Evan Bradley Mathis (born November 1, 1981) is an American football offensive guard for the Arizona Cardinals of the National Football League (NFL). He played college football at Alabama, and was drafted by the Carolina Panthers in the third round of the 2005 NFL Draft. Mathis has also played for the Miami Dolphins, Cincinnati Bengals, Philadelphia Eagles and Denver Broncos. Mathis graduated from Homewood High School in Homewood, Alabama, where he played football and competed in track and wrestling. He was coached by Bob Newton in football. In wrestling, Mathis won the 2000 Alabama 6A heavyweight championship. In track & field, Mathis competed in the shot put event (top-throw of 15.24 meters). Although he bulked up from 240 pounds (110 kg) to 276 pounds (125 kg) after signing with Alabama in February 2000, Mathis was redshirted as a true freshman. In April 2001, he was named the Paul Crane Most Improved Offensive Lineman for Alabama along with tight end Theo Sanders. He competed with Alonzo Ephraim for the starting center job during spring practice in 2001, but lost out. Instead, he beat out Dante Ellington for the starting right tackle job, making his first start against South Carolina. Mathis started four seasons on the offensive line for the University of Alabama Crimson Tide. His first three years he played tackle, before shifting to left guard as a senior. He started 47 consecutive games beginning in the 4th game of his redshirt freshman year. He helped anchor an offensive line that paved the way for the Tide to lead the Southeastern Conference in rushing yards per game in 2004. Mathis was signed by the Miami Dolphins on September 9, 2008 after Donald Thomas, their rookie starting right guard spot was put on injured reserve. The Dolphins released him November 8 after playing seven games for them. Mathis played for the Cincinnati Bengals from 2008–2010. He did not allow a sack during the 2009 and 2010 seasons. The Philadelphia Eagles signed Mathis to a one-year contract on July 31, 2011. Immediately after the preseason, Mathis won the starting job at left guard for the 2011 season. He signed a five-year, $25.5 million contract with the Eagles on March 17, 2012. Pro Football Focus rated Mathis as the best guard in the NFL for the 2011, 2012, and 2013 season. In 2014 he was rated as the second best guard in the league despite missing seven games due to injury. Named to the USA Today All-Pro Team after the 2012 season. Ranked number 6 overall in Pro Football Focus' Top 101 of 2012. In 2013, Pro Football Focus chose Mathis for its inaugural Bruce Matthews Award recognizing the NFL's best offensive lineman. He was voted First Team All-Pro in 2013 for his excellent performance with Philadelphia. Mathis was released on June 11, 2015 after he held out of OTAs in search of a new contract. On August 25, 2015, Mathis agreed to a one-year, $2.5 million contract with the Denver Broncos. On February 7, 2016, Mathis won his first career Super Bowl when the Broncos beat the Carolina Panthers 24-10 in Super Bowl 50. Mathis signed a one-year, $6 million contract with the Arizona Cardinals on March 16, 2016. He was placed on injured reserve on October 8, 2016 after suffering an ankle injury in Week 5 against the San Francisco 49ers. His uncle is Bob Baumhower, who played defensive tackle for Alabama and the Miami Dolphins. In 2010, Mathis founded Zone Athletic Performance in Scottsdale, Arizona, where he and many other professional athletes train in the off-season. ↑ Lumpkin III, Bill (June 16, 2000). "Alabama, Mississippi stars face off tonight". Gasden Times. Retrieved 2011-07-31. ↑ Deas, Tommy (April 15, 2001). "Croyle wrestles Myles down after touchdown". The Tuscaloosa News. Retrieved 2011-07-31. ↑ Hurt, Cecil (March 15, 2001). "Franchione doesn't see same move as Tuesday". The Tuscaloosa News. Retrieved 2011-07-31. ↑ Hurt, Cecil (August 5, 2002). "Dante Ellington takes redshirt to improve". The Tuscaloosa News. Retrieved 2011-07-31. ↑ Hurt, Cecil (October 4, 2001). "Franchione shuffles secondary lineup". The Tuscaloosa News. Retrieved 2011-07-31. ↑ Swarz, Bryn (July 31, 2011). "Allure Of Mudd Lures Vet Mathis". philadelphiaeagles.com. Retrieved 2011-07-31. ↑ Graziano, Dan (July 31, 2011). "Eagles sign Mathis, wait out Watkins". ESPN.com. Retrieved 2011-07-31. ↑ McLane, Jeff (August 27, 2011). "Herremans to RT; Mathis to LG. Evan Mathis quickly rose to the top of most NFL offensive lineman ranks.". philly.com. Retrieved 2011-08-27. ↑ Elsayed, Khaled (January 5, 2012). "2011 PFF All-Pro Team". profootballfocus.com. Retrieved 2012-02-10. ↑ Davis, Nate (February 13, 2013). "Alex Smith, Super Bowl QBs headline USA TODAY Sports' 21st All-Joe team". usatoday.com. Retrieved 2013-05-18. ↑ Elsayed, Khaled (May 3, 2013). "PFF's Top 101 of 2012". profootballfocus.com. Retrieved 2013-05-18. ↑ Monson, Sam (January 9, 2014). "2013 Bruce Matthews Award". profootballfocus.com. Retrieved 2015-02-19. ↑ Brady, James. "Evan Mathis released by Eagles, per report". SB Nation. Retrieved 11 June 2015. ↑ Mason, Andrew. "Broncos agree to terms with two-time Pro Bowl guard Evan Mathis". DenverBroncos.com. Retrieved 25 August 2015. ↑ Patra, Kevin (March 16, 2016). "Cardinals agree to 1-year contract with Evan Mathis". NFL.com. Retrieved March 16, 2016. ↑ Urban, Darren (October 8, 2016). "Evan Mathis Placed On IR". AZCardinals.com. ↑ Kiper Jr., Mel (August 12, 2002). "Alabama in hunt in SEC West". ESPN.com. Retrieved 2011-07-31. ↑ Obert, Richard (June 17, 2011). "NFL lineman getting himself, others in shape at his Scottsdale gym". The Arizona Republic. Retrieved 2011-07-31. Wikimedia Commons has media related to Evan Mathis.